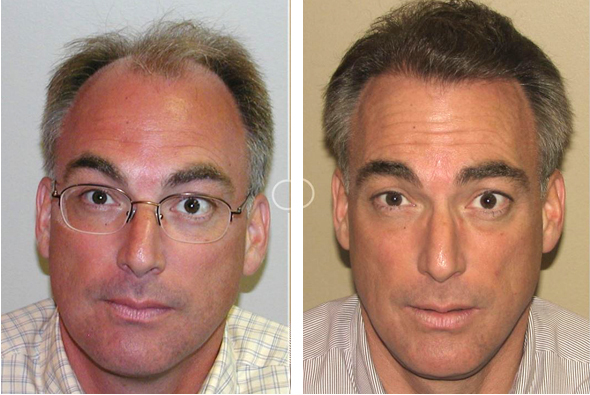 Perhaps one of the earliest adopters of dense packed hair transplant procedures was Dr. Ron Shapiro of Minnesota. He understood before most that the best way to get a full yet natural looking head of hair was to use tremendous numbers of small grafts called follicular units (FUs), and that these grafts would have to placed very very close to each other in order to achieve the desired affect. This sounds easy on paper, but in reality it requires incredible patience, skill, and dedication on Dr. Shapiro’s part as a surgeon and on each and every one of his staff members. Dense pack hair transplantation is a “team sport” without which consistently incredible results like the one you can see below are simply not possible. 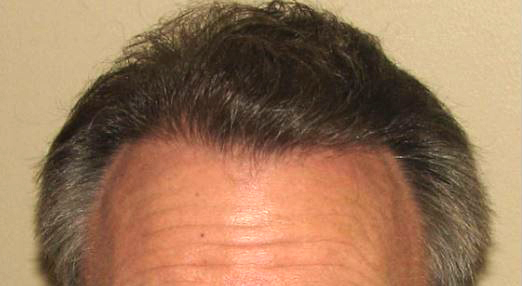 Here is a classic case of very advanced male patterned hair loss. It didn’t take Dr. Shapiro long to assess the issues and come up with a game plan tailored to this particular individual. He had lost all his hair in the front and top of his scalp except for that small “Mohawk” of hair you can see standing out as an island right in the middle. There was no hairline and there was no bulk of hair. The result was a very unbalanced hairstyle that even the quickest glance would leave the impression and label of “bald man” in the mind of the looker. To combat this, Dr. Shapiro implanted thousands of tiny grafts, called follicular units, into the hairline and the areas behind. After full growth the improvement is astonishing and explains why Dr. Shapiro and his team have one of the very best reputations in the field. After growth of the new hair you can now see his face is properly framed and his overall hairstyle is balanced and full. Interesting to note is that the “Mowhawk” is still there it’s just that Dr. Shapiro integrated it into the rest of the hair. He also thickened it so that should the mohawk hairs die out the new hairs will be able to keep that center spot covered so that it wouldn’t be noticed. This patient can go to his usual barber for hair cuts without fear because the new hair grows just like the old hair did before it fell out. And, the chances of the new hair falling out is virtually nil since it was taken from the back of the head which are resistant to falling out. 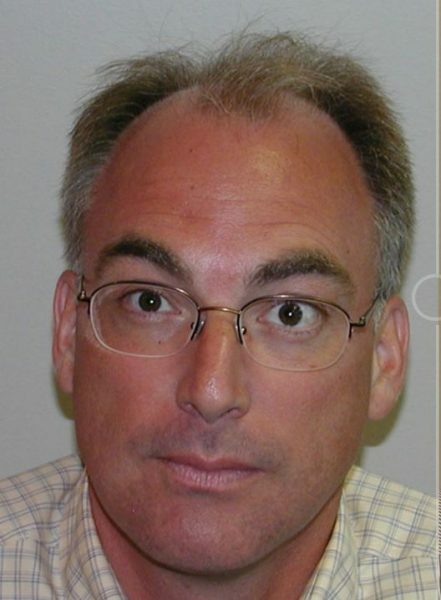 Also note the new hairline. It looks natural because Dr. Shapiro packed in single hair grafts right at the front, then transitioned to two hair grafts as he moved back into the scalp. This created a feathered look that mimics nature quite closely. Finally, he knew to break up the hairline so it wouldn’t look artificial or man made. Producing results like this is not easy and VERY few doctors can perform at this level on a consistent basis. That’s why you must go out of your way to make sure that you pick a doctor like Ron Shapiro, MD for your own hair transplant.